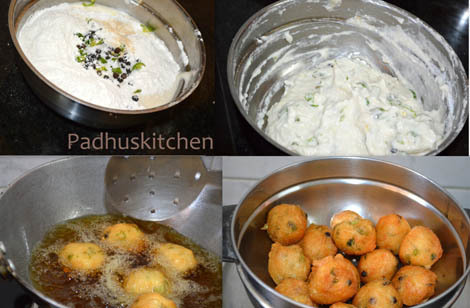 Mysore Bonda is make of urad dal and is a very easy snack recipe.My mother is an expert in making crispy bondas. Today I am going to share with you the secret of making crispy and tasty bondas. This is a perfect tea time snack. Some prepare this even for Diwali. Now shall we learn how to prepare crispy bondas? Hot n crispy Bondas with a cup of ginger tea! Wash and soak urad dal for 30-40 minutes. Drain the water completely and grind adding very less water (otherwise the mixie will not grind ) to a smooth paste just as you grind for ulundu vadai. Add green chilli and salt while grinding. Then remove the batter from the grinder/mixie. Take that ground dal in a bowl, add rice flour (secret ingredient for crispy bondas), whole black pepper, coconut bits, hing, curry leaves and coriander leaves. Mix well. Fry both sides till golden brown and remove it in a colander or a kitchen towel to drain off excess oil. Serve hot with coconut chutney and a cup of tea. Heaven!! Surprise your guests and family members by preparing this easy mysore bonda recipe and I am sure everybody is going to ask you the secret of crispy bondas. Wishing you all a very Happy Diwali. I am taking a break till Diwali. Have a wonderful time with your family and friends. If you are searching for Diwali recipes, then search no more!! I have put in lot of hard work and compiled all the recipes at one place to make it easier for you all. Find a list of Easy Diwali Sweets and Snacks Recipes which can be easily prepared at home. perfect with a hot cuppa coffee.. Thank you for reminding the great recipe.which will go good with idly on Deepavali day.I am going to make this on deepavaliday. Very attractive cuties, feel like munching some. Crisp on the outside..perfect bondas!! sound like a nice snack! Happy Diwali. Hey my mouth"s watering. So tempting. Thks. for the Lovely pictures. Yummyyyy! Thanks for reminding, I made it n wow it turned crispy n superb. More than times tried....alll turned well nothing to failure.....whenever my hus asked for snacks I am always go for this bonda...........it never dissappoints me...thank u soo much akka.Newly married grls like me are learning from ur site. Loved this. As you said, it came out nice and crispy! This recipe is incorrect. Mysore bonda uses Miada and rice flour. 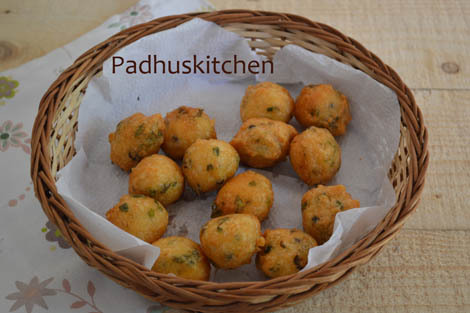 Regular bonda uses Urad dal. 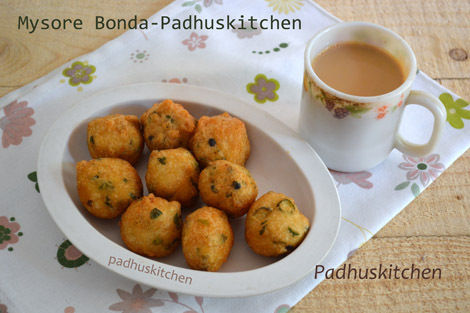 This is a very good recipe for regular bonda. can they be made beforehand and kept warm in the oven?